International Journal of Business & Applied Sciences warmly invites proposals for special issues that capture cutting-edge research insights and trends in the field of business and applied sciences with significant theoretical and practical implications. 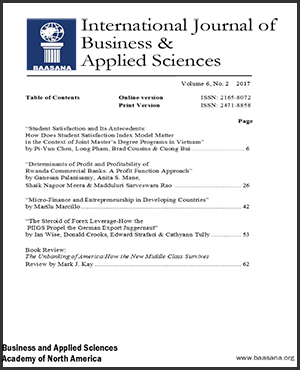 International Journal of Business & Applied Sciences (ijbas.com) is unique in a sense that it encourages interdisciplinary research and provides a platform for dialogue among researchers in general business and applied sciences. Proposals should be submitted to the Editor-in-Chief of International Journal of Business & Applied Sciences, Dr. Yam B. Limbu (Email: ijbasj@gmail.com) and Associate Editor for Special Issues, Dr. Gouher Ahmed (Email: Gouher@usa.net). When submitting proposals, please include in the email subject line: ‘IJBAS’ Special Issue Proposal’. All proposals will be reviewed by members of the editorial team and assessed based on the quality of the likely contributions and their relevance to the mission and scope of International Journal of Business & Applied Sciences. Decisions will be conveyed to the SI proposers approximately 4 weeks after the submission of proposal. The publication date will be allocated once all the papers for the SI have been accepted.